Some times simple is best. It is all too easy to keep adding flavours and textures when the essence of the idea has already been captured. Brussels sprouts and pine nuts are one of life’s great flavour combinations. Each is used to perfection here, and the little twist of lemon and black pepper at the end just round things off nicely. As with all simple things you’ll need to make sure your seasoning is spot on and your risotto perfect to raise the simple to the elegant. This will make more than you need but it’s very hard to make less than this. Luckily it is one of life’s beautiful things and it won’t last long once you’ve tasted it. Try tossing vegetables in it, eating it with pasta, watering it down and dressing salads with it - or just eating it on toast! Have these things to hand ready. This recipe comes in two parts, the preparation of the brussels and the cooking. You can shred them up to 8 hours ahead of when you need them and finish them when you are going to serve them. This risotto is stripped back to the bones, there is so much flavour in the Brussels sprouts that you really just want a lovely rich, creamy texture to compliment their bold garlickyness. Toast the pine nuts in the oven for 4 minutes until hot but not yet browned – if they colour it will make your risotto murky. Put into a high power blender and blend with the rest of the ingredients until very smooth, stopping occasionally to scrape down the sides of the blender if needed. Transfer to a storage box and keep in the fridge – for up to 2 weeks – until needed. Carefully remove the good outer leaves from the Brussels sprouts and place them in a bowl. Toss them in oil and salt and separate them onto a dehydrator tray or, if using an oven, on a lined baking tray. Put in the dehydrator for 4 hours or until dry and crisp, or into the oven until the same effect is achieved. Transfer to a storage box and keep – for up to 2 weeks – until needed. To make this dish easily make sure you have prepared all the recipes above in good time and that you have them to hand. Also have a lemon, a fine grater and your peppermill. Make sure your Brussels are shredded and you’ve got some garlic parsley oil before you start the risotto. Start cooking the Brussels once the risotto is 2/3 ready so that they will both ready at the same time. Risotto does not keep well once made so you need to make sure that the Brussels are ready before the risotto. Set 4 fine starter sized bowls out ready. Put a frying pan on the hob ready for the Brussels so you don’t have to leave your risotto to find one. Make sure your shredded Brussels, garlic parsley oil and pine nut butter are ready next to the hob when you start the risotto. Carefully remove any damaged outer leaves from the Brussels sprouts and trim the root end so it looks clean and fresh. Cut them in half lengthways and then slice them crossways with a sharp knife very finely. Transfer to a storage box and keep in the fridge – for up to 8 hours. Put the stock into a pan and bring to a simmer. Heat the olive oil in a small pan and then gently sweat the shallots until just soft, but not coloured. Add 3 ladles of stock and cook, stirring constantly. Whislt still cooking your risotto, heat a frying pan for your Brussels sprouts and add 3 tablespoons of garlic parsley oil making sure you stir it first so there is plenty of garlic and parsley in the pan. Once the oil begins to sizzle add your Brussels and two big pinches of salt. Stir and turn down the heat to gently stew them whilst still working the risotto. Continue to stir the Brussels sprouts occasionally until they are softened and bright green, this should take about 7 minutes. Once they are done remove from the heat and keep warm, you’ve got about five minutes until they become discoloured. Keep working the risotto until the rice is 9/10 cooked, that is to say edible but just underdone. The texture should be a touch drier than a normal risotto as the pine nut butter will melt and make it much looser. Add the pine nut butter and stir to emulsify with the starch from the rice. Taste and season well with salt so that the pine nut flavour rings out rich and strong. Pour the risotto evenly between the bowls taking care to keep it on one half of the bowl. Split the Brussels sprouts between the bowls filling the other half of the bowl so that the appearance is a circle split into two neat halves. 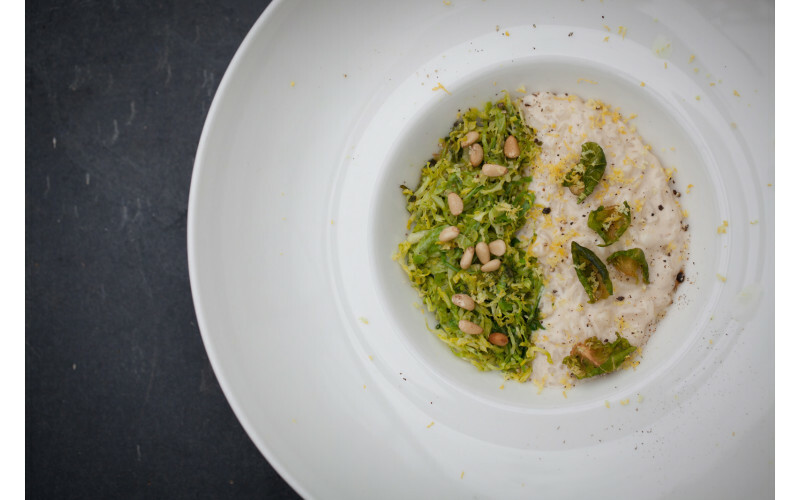 Sprinkle a few pine nuts over the Brussels sprouts and a few brussel crisps over the risotto. Grate a generous amount of lemon over the top of the whole bowl and then crack some pepper over that. Simple food is the hardest to make well. Put simply, there is nowhere to hide, if you have a hundred ingredients and lots of big flavours then any mistakes are covered up in the mix but when things are stripped back to the bones then you have to get every part right. Risotto has a special place in my heart; it is so simple and can be made so badly, but when it is right then there is nothing more satisfying or graceful. It is very easy but you have to care about every ingredient and every step. To make a perfect risotto you must first dice your shallots very finely and evenly so they fry quickly and evenly. If using garlic, it must be minced to a purée so there are no lumps in the final mix. If you are adding wine you must choose one with the right balance of richness, acidity and sweetness to balance whatever flavours you are planning to add at the end. When you add your stock it must be home made and must have real depth of flavour with light fresh notes sprinkled across the top that add interest to the final dish. You must choose the right rice – arborio for a simple clean flavour with little texture, carnaroli for a firmer bite. Alternatively, think outside the box and use a whole grain rice if you don’t want it too starchy and want a nuttier flavour or even barley grain for a popping texture and more satisfying mouth feel. When you cook the rice you must work it constantly and evenly to create a creamy texture and you must add your stock with care. When you finish cooking the rice you must stop at just the right point - just underdone and a touch too wet, - so that, as the rice continues to absorb liquid whilst you add the other ingredients, it is done perfectly when it is ready to eat. When you add the final ingredients they must be simple and taste of themselves and they must be cooked perfectly. When you season the final dish it must be light and lift the flavours of the ingredients and not taste of salt. Get all of this right and your bowl of rice will be a work of art, skip a step or get it wrong and it may taste ok but it will just be a bowl of rice.